This interesting surname is English. It is a patronymic form of the ancient given name 'Osekin', itself a diminutive of various early personal names which commence with the pre 7th century first element of 'os', meaning god, and cognate with the Old Norse word 'as'. The addition in Medieval English of an inorganic letter 'H' to names beginning with a vowel, is a relatively common phenomenon of the surnames listing, with as other examples Hayton and Ayton, or Halton and Alton. The surname development of this surname since the medieval period has included examples such as Peter Osekyn of Essex in 1306, Thomas Hoskyns of Berkshire in 1453, and William Hoskyn of Kent in 1472. 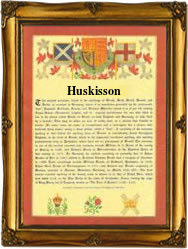 The diminutive forms of the surname spelling include Hosken, Hoskin, and Hosking, the patronymics Hoskins and Hoskyns, and the double diminutives Huskinson, Hoskisson and Huskisson. A coat of arms granted to the family has the blazon of a silver shield divided per pale red and azure, and on a gold chevron between three silver lions passant, as many cinquefoils of the first. The motto Vis unita fortior translates as "Strength united is the more powerful". The first recorded spelling of the family name is shown to be that of Robert Osekin. This was dated 1274, in the Hundred Rolls of London, during the reign of King Edward 1st of England and known as 'The Hammer of the Scots', 1272 - 1307. Surnames became necessary when governments introduced personal taxation. In England this was known as Poll Tax. Throughout the centuries, surnames in every country have continued to "develop" often leading to astonishing variants of the original spelling.